For all of you who think FOX News Channel and FOX Business Channel are biased toward the rich and dismissive of the poor, check out John Stossel's "Freeloaders" TV special on Fox News Channel, originally broadcast on Friday and Saturday and airing at 9 p.m. and midnight eastern time on Sunday, March 27. link:http://stossel.blogs.foxbusiness.com/2011/03/26/i’m-a-freeloader-fox-news-special-re-airs-today-at-3pm-sunday-at-9pm-midnight-est . I'm currently reading Ayn Rand's 1957 novel "Atlas Shrugged" in preparation for my viewing the movie version that will be on the big screen in mid April. Ayn Rand would approve of Stossel's take on freeloaders, especially the corporate ones he cites like General Electric. In case you haven't heard, GE -- the biggest industrial corporation in the world -- not only didn't pay any U.S. income taxes last year, the company got millions of dollars in refunds. Farm subsidies go to millionaires like Bon Jovi, who pays property taxes of only $100 a year on his extensive real estate holdings in New Jersey -- because he raises bees on the property. Fellow Jersey Guy Bruce Springsteen is in the same catbird seat, because he leases some of his real estate to an organic farmer. Stossel poses as a panhandler -- with a long beard reminiscent of the ones the actors wear in the 2000 Coen Brothers movie "O Brother, Where Art Thou" -- and rakes in the equivalent of $24,000 a year with crude hand-lettered cardboard signs that includes one that reads he just wants the money for beer. Stossel talks to a man whose company encourages people to walk away from their house, if said house is worth less than the mortgage. It's called "being underwater." He asks the man if this is moral and the business owner says morality doesn't play any role. In big government America today, it’s rich people who freeload the most. Corporations do it. And rich individuals do it. 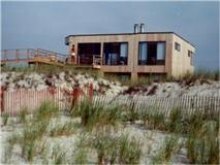 People like me.Years ago, I built this beach house on the edge of the Atlantic Ocean. My father told me, “Don’t do it, it’s too risky. No one should build so close to an ocean.” But I built anyway. Why? Because cheap federal flood insurance guaranteed my investment.Congress created the National Flood Insurance Policy to help foolish people who don’t buy private flood insurance and then lose their home when the water rises. Politicians said people didn’t buy private insurance because the greedy private companies charged too much. The politicians would hire people to price the policies “properly.” Give me a break. Today taxpayers guarantee insurance for billions of dollars in waterfront property. You may foot the bill if a flood destroys Derek Jeter’s new mansion in Florida, or the Kennedy Compound in Massachusetts. Eventually, a storm swept away my first floor. But I didn’t lose a penny. Thanks! I never invited you there, but you paid for my new first floor. A few years later, the whole house went. Again, government flood insurance covered my loss. Rich people freeload off you taxpayers all the time, because the over-promisers in Washington make deals for politically-favored groups. Those groups tend to be the affluent, because the rich can afford lobbyists to persuade Congress to give them special tax credits-- like the one for electric cars. Because of that tax credit, I got a FREE golf cart. Buy a cart for $6,000 and get a $6,000 tax credit. I also put solar panels on the roof of my new home. Why? Because Congress and state legislators gave me a big tax credit. It reminds me of all the well-intended government handouts to farmers. They mostly just benefit wealthy farmers and people like Bon Jovi, who pays only $100 in state property taxes on many acres of land. Because he raises honey bees, he qualifies for a honey bee subsidy. Bruce Springsteen also owns acres of property in New Jersey, but pays little tax on it because an organic farmer works the land. America’s single biggest recipient of farm subsidies has been Maurice Wilder. The multi-millionaire owns some farm land, but he mostly builds homes and offices. Others who’ve collected farm subsidies are basketball star Scottie Pippin, billionaire Ted Turner, even the family of anti-subsidy Congresswoman Michele Bachmann. None of those people broke any laws. They or their families just own land that qualifies for handouts. But think about how much money we could save if government just didn’t pass laws that encourage freeloading. In case you missed it last night, my Freeloaders special re-airs on FOX News Channel today at 3pm, and tomorrow at 9pm & midnight (all times eastern). No group has been more "helped" by the American government than American Indians. Yet no group in America does worse.Almost a quarter of Native Americans live in poverty. 66 percent are born to single mothers. They have short life spans. Indian activists say the solution is -- surprise -- more money from the government. But Washington already spends about $13 billion on programs for Indians every year. There are special programs in 20 different Departments and Agencies: Empowering Tribal Nations Initiative, Advancing Nation to Nation Relationships, Protecting Indian Country, Improving Trust Land Management, New Energy Frontier Initiative, Climate Change Adaptation Initiative, Construction, Improving Trust Management, Tribal Priority Allocations, Resolving Land and Water Claims, Indian Land Consolidation Program. This is just a partial list. But that's still not enough for Indian activists. In my Fox News Special "Freeloaders" , Elizabeth Homer, who used to be the U.S. Interior Department’s Director of American Indian Trust, argues the government must do more. I say government already does too much. Indians would be better off without government handouts. I have evidence: tribes not recognized by the federal government, tribes that get no special help, often do better. Members of the Lumbee tribe from Robeson County, NC, own their own homes. They succeed in business. Lumbee tribe members include real estate developer Jim Thomas, who used to own the Sacramento Kings. Lumbee Jack Lowery helped start the Cracker Barrel Restaurants. Lumbees started the first Indian owned bank, which now has 12 branches. The political class doesn't understand that its independence, not government management, that allows people to prosper. Congressman Mike McIntyre (D-NC) is pushing a bill called the Lumbee Recognition Act. This bill would give the Lumbees the same "help" that other tribes get. That would give the Lumbees about $80 million a year. "We shouldn't take it!" says Lumbee Ben Chavis, another successful businessman. Chavis says not getting any handouts is what makes his tribe successful, and if the federal money starts coming, members of his tribe "are going to become welfare cases. Its going to stifle creativity. We don’t need the government giving us handouts." So, even if you hate FOX, put aside your prejudices, put a clothes pin on your nose, and watch Stossel. You might even decide to read "Atlas Shrugged" yourself, or see the movie beginning April 15. By the way, Bachmann's family property isn't even in her home state of Minnesota; it's next door in Wisconsin! The photo accompanying this story is of Stossel's beach house.